It has been a long weekend, and I felt like I needed something other than copious amounts of chocolate to cheer me up. As such, this Sondra Roberts smile tote was exactly the dose of fun and giggles that my tired little brain needed. 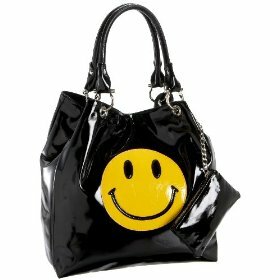 The smile image is iconic, seen around the world in hundreds of different forms: T-shirts, desktops, and now handbags. There is something about that cheeky grin and yellow face that makes even the grumpiest people crack out a smile; and what more could you wish for in the dark miserable winter weather? That said, this patent purse isn't one of those seasonal bags; the logo has been around for so long that I would image it could survive a good few fashion seasons being both brilliantly in, and terribly out of, fashion! A little bit geeky, this bag is full of cheery nerd chic that can look fabulous when done right! Of course patent and bright yellow isn't a subtle combination, and if you want to go unnoticed you should probably leave this in the closet. Or, perhaps, you could just wear it in reverse, with the face hidden. That way it is just a simple spacious black patent tote; functional but nothing more. Now how is that for fun loving versatility! The Paul Frank The Julian satchel, a great alternative to this cartoon purse.